November 24, 2018 by Laurie 15 Comments This post may contain affiliate links, which means if you click on a link and purchase something, I may earn a small commission (at no additional cost to you.) See my disclosure policy HERE. Print your very own reverse advent calendar and join the PPP Team in giving back this year! 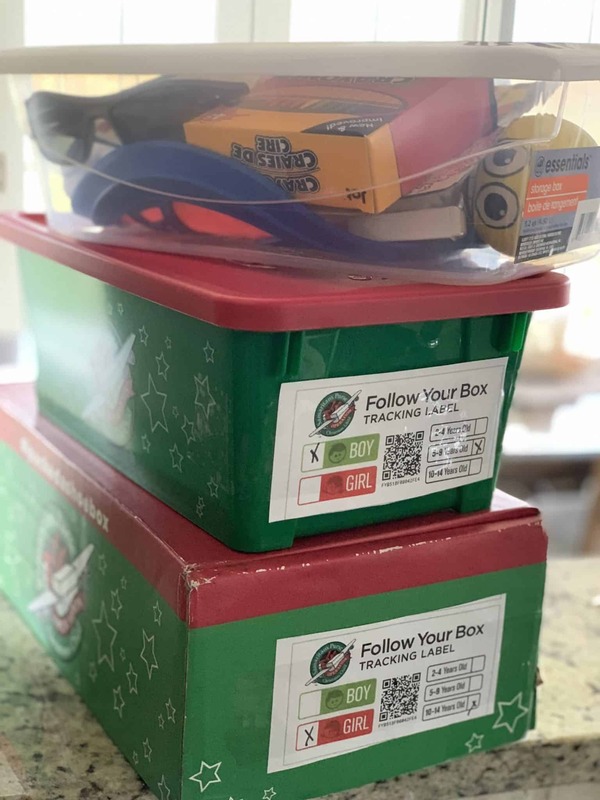 If you're looking for a great way to share with your families this Christmas season, use this reverse advent calendar to track items each day during December to add to a donation box! This is such an amazing way to easily give back this year, and will not only bless those in need in your community, but also keep your family focused on the true meaning in this season. Of course, you can always choose to do this same concept in a different way ~ maybe put $1 in a basket each day and donate the money you save at the end of the month to a local food pantry, or clean out your pantry all at once before making a trip to your local food pantry. No matter how you choose to give ~ just considering doing something small for those in need this Christmas season. We are blessed to be a blessing, and I'm excited to join you this year as we bless others who may need an extra gift this year! 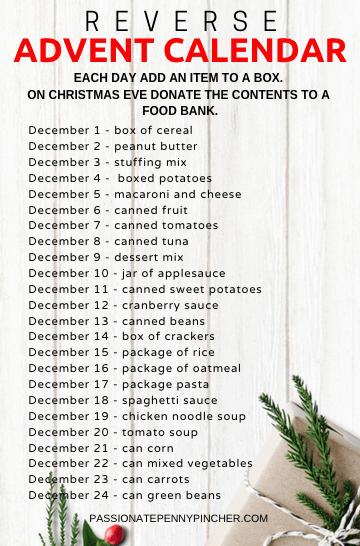 Note: we'll be updating our Holiday Food Donations post each week so you can find these items inexpensively too ~ go HERE to see the list. Looking for more ways to give this season? Can I share this on my church’s fb page? I would love that Sheryl – thanks so much for checking! I love that Adele – that totally makes my day! Thank you for sharing! Saw this on FB awhile back and shared it so I was able to find it on my home page and have printed it out so I will be ready starting Dec 1st. Now the trick is to follow thru to the end. Wish me presistence, started to say luck. No luck involved just “do it” to steal a saying. Terrific list! I shared it on my FB page, and friends (one of whom used to work as Family Support Specialist) noted that it should be concluded and taken to the Food Bank a few days before Christmas Eve because the banks usually hand out the Christmas boxes around the 22nd or 23rd. Just a suggestion — maybe start the advent calendar the day/week after Thanksgiving? Thanks for great ideas! While this is a great suggestion, the food pantry that I volunteer at has a drastic drop off of donations after the holidays. No one should go hungry for the holidays, but many people are still hungry later on. I plan on delivering mine after the first of the year. Lots of people are reminded around the holidays but we shouldn’t forget people are hungry all year! Thanks for the great Advent Calendar, my family intends to participate! Thank you so much Susy for sharing and all you do! And I agree – we keep a food box by our back door, and any time I go to the grocery I just add a few more things on each trip. Then every month or two I drop off the food at our local food pantry – while this is a wonderful season to focus on it, it’s so important to give all Christmas season long! I just shared this on my neighborhood group page (Facebook) and everyone was excited. We have a local food pantry for our little town in Ohio. Thank you for showing us a way to pay it forward! I love this idea! My 3 year old and I are participating this year. I know its a bit late, but I made this and cover up the days with a post it note so he has something to take off the calendar every day before getting the food and putting it in the box. Thanks so much for the great idea! I love this idea, I love the idea of donating to the local food bank, but I am modifying to meet the needs of a family member. When I found out a disabled family member was trying to survive on $15 a month on food stamps, I decided to do this for my own family. Merry Christmas to all.